Spring has sprung on the farm and it’s time to start thinking about your spring family vacation! Your spring family farm-stay vacation includes SPECIAL DISCOUNTS and a FREE Hull-O Farms take-home gift basket. 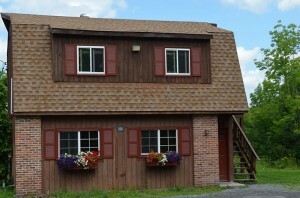 Book your mid-week spring farm vacation and receive 10% OFF you stay. A take-home gift basket with our famous Farmer’s Wife Buttermilk Pancake Mix, Real Maple Syrup (locally crafted), local-made jam, specialty teas, honey sticks, Ms. Sherry’s recipe for Apple Crisp, and farm-fresh eggs. This is a two story country chalet that was named after Grandpa Hull and is located at the very edge of our 300-acre farm. This country home has 3 bedrooms ( 1 queen, 1 full with bunk beds and another with set of bunk beds), a sleeper sofa and futon, 2 bathrooms, living room, family room, dining area and full kitchen. A glass-doored wood-stove also helps set the mood on brisk country evenings. A 32-foot second-story deck overlooks our scenic Durham Valley (a view that will remain in your mind long after your vacation is over). 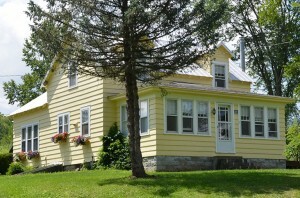 A two-story, cheery country home that was named after Grandma Hull and is walking distance from the barns. 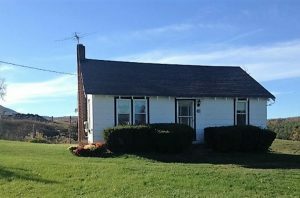 It has 4 bedrooms ( 2 queens, 1 full, 1 with four twins), a full kitchen, full bath, sun porch, living room with glass-doored wood-stove, entry room, and deck which overlooks the cows in the meadows. 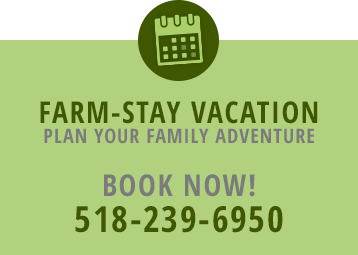 Want to get updates and discounts on our family farm stay vacations? Sign up for our eNewsletter! Words that soak into your ears are whispered... Not yelled. Don't interfere with somethin' that ain't botherin' you none.